Vinay Dabholkar summarized his views on sustaining participation in innovation initiatives on Cataling Innovation Consulting’s website. Through this, Dabholkar highlights the main challenge that innovation programs face. Sustaining participation is strenuous mainly because individuals quickly lose interest. As the innovation initiative first launches, individuals enthusiastically participate and contribute greatly. However, the enthusiastic energy and positive demeanor quickly diminishes soon after and is rapidly turned into apathy. There are 3 main reasons as to why sustaining participation becomes a dominant challenge. The first being that innovation is at times understood to only be for companies that wish to invest heavily and not looked upon as a fundamental management style. Thus, many individuals believe that such an innovation is not meant for them. Alternatively, frustration stems from idea authors who aim to improve their concept into a presentable business proposal. However, the lack of collaboration leads to immediate irritation. Lastly, a dashboard enables for participants to communicate adequately on the improvement of the innovation initiative. 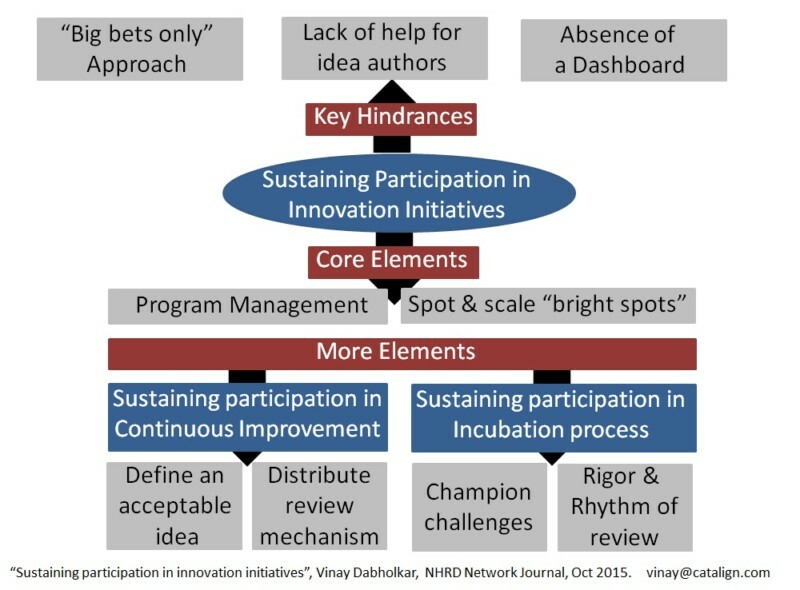 The absence of an innovation initiative dashboard (also known as an innovation web portal) forces individuals who participate in such a program to be left in the dark concerning their progress and what others have achieved or contributed. The paper continues to discuss the core elements that are suggested with any innovation initiative. A full or part time management program as well as a precise focus on spotting and scaling “bright spots” are two core elements instructed in the article for this initiative. In addition, program managers are directed to keep an eye out for such indicated bright spots. By defining an idea and through a distributed review mechanism, the continuous improvement process helps to attain the necessary participation in the initiative. Incubation effectiveness as well is a common contributor. However, it is through a different approach. Instead, the aim is to champion a challenge and maintain a good and constant review of the project. Guaranteeing participation in innovative initiatives requires work and time in order for the efforts to be successful. For a further reading on sustaining participation in innovative initiatives, click here.